His head is covered with bandages, but his eyes are as keen as always. 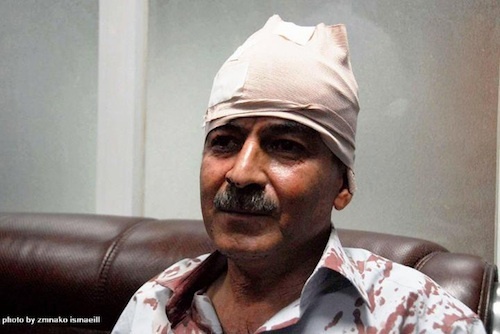 Asos Hardi, the Father of independent journalism in Iraqi Kurdistan, is hurt but not defeated. A lone attacker beat him up, like many opposition journalists before him were targeted. The difference is, that Hardi is respected and honoured, outside and inside the country. It comes as a shock, that Hardi should be targetted. ,,I am on the list of targets'', he says himself about the incident. During the demonstrations that opposition voices staged against the Kurdistan government from February to April, an anonymous death list with the names of dozens of journalists and activist survaced.A number of people on that list have since then been beaten up. Since the demonstrations started, dozens of incidents have been reported. Journalists were threatened and beaten up by security police, they were taken to alleys or to shops converted to interrogation rooms, and sometimes their camera's were taken. Officially KRG has freedom of speech, and a press law that regulates the work of journalists. But since the protests started, the press has increasingly been under attack. Partly so, because many independent journalists took sides with the demonstrators. They were not just reporting, they took part in the demonstrations. Many prominent journalists held speeches at the main square in Sulaymaniya where protesters gathered - Asos Hardi was amongst them, as was his brother Rebin who is affiliated with the opposition party Goran. Rebin Hardi was also attacked a couple of weeks ago. Is that a reason to threaten journalists and beat them up? Is the fact that they show an opinion which is not the same as the ruling parties' enough reason? But is the role of journalists in any democracy not also to be critical? The attack on Asos Hardi took place on the last day of Ramadan, in an alley in Sulaymaniya near to the newspaper Awene. Hardi was the last to leave. When he walked to his car, a man was waiting. That was not surprising to him; many people address him on the streets to show their support or to ask questions. Hardi is a respected man in Sulaymaniya. He is the pride of the town, especially since he was rewarded with the Gebran Tueni Award in Beirut last year for courageous reporting. When Hardi opened the car door, the man struck him on the head. Doctors say he probably used the back of a pistol. He received about six blows, before two young men entered the street and the attacker fled in a car that was waiting. Hardi was taken to hospital and needed 32 stitches in his head. He has no idea who the attacker was. He saw him well enough, and he would like to assist the police make a picture drawing to help find him. When I spoke to him, he showed no conviction that the perpetrator would be found and punished - as also in the past attackers of journalists in Kurdistan have never been found. The killer of Soran Mama Hama, an independent journalist killed in Kirkuk in 2008, is still at large. Many people point fingers to the Kurdish authorities, or to the security forces of the ruling political parties in Kurdistan for the attacks on journalists. They see them as part of a campaign to silence the press. Short sighted forces in Kurdistan only think that 'who is not with me, is against me'. That discussion and criticism are necessary for any democracy to develop, and that journalist play an important role there, they do not seem to grasp. The reactions on Facebook on the attack of Hardi were numerous, with many people calling it 'unacceptable'. A group of journalists and a number of international organisation already protested against the attack. Because of the Eid holiday - which in Kurdistan lasts 9 days - there has not been any comment from the side of the government yet. Many people on Facebook demand a condemnation, some saying that silence only supports those that think the government was behind it. Hardi survived, and he will be well again soon. But a big blow was administered to the press in Kurdistan, as well as to the trust in a developing democracy. If someone as respected as Asos Hardi can be beaten up in broad daylight, what does that mean for less respected and less protected journalists and others? Asos Hardi is a friend of many years. When he gets hit, I feel hit too. But this is not just about friendship. This incident has a negative effect on the trust I have in the development of democracy in Iraqi Kurdistan. And I am sure this does not only affect me. What does it mean to the outside world when a country cannot protect its opinion makers? The perpetrator has to be found, and fast, for this trust to be repaired in any way soon.